This week, the National Association for the Education of Young Children (NAEYC) is celebrating their annual Week of the Young Child. This week is meant to highlight the importance of early learning, young children, their teachers, families, and communities. NAEYC encourages everyone in the early learning community to host events celebrating young children and their learning throughout the week. Each day has a specific theme: Music Monday, Tasty Tuesday, Work Together Wednesday, Artsy Thursday, Family Friday. These themes are meant both to engage children and showcase the various ways that teachers and families support the development and learning of young children. FFYF is excited to join in this NAEYC in celebrating young children and the teachers, families, and communities that support them. 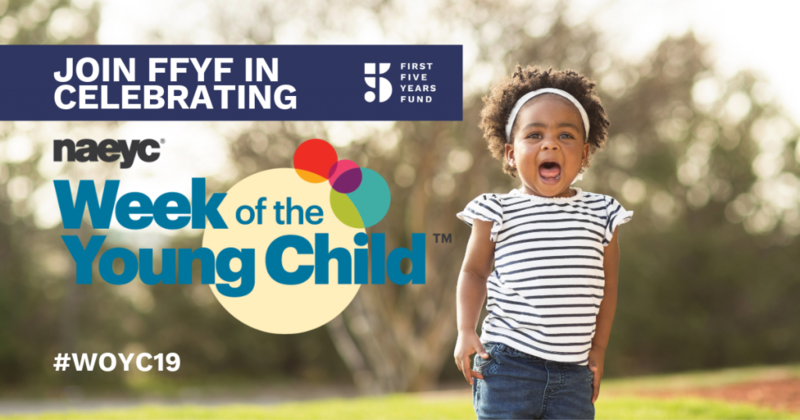 To learn more about the Week of the Young Child, including event ideas for each day, visit NAEYC’s website.